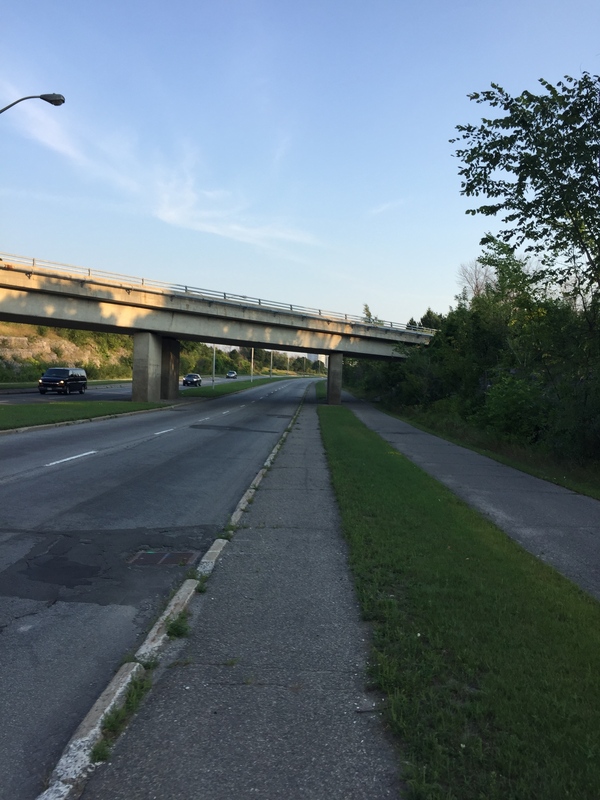 There are a number of bike routes one may follow to get to the Ottawa International Airport from downtown. Starting off from the corner of Laurier Avenue and Percy I headed south along the Percy Street bike lane. 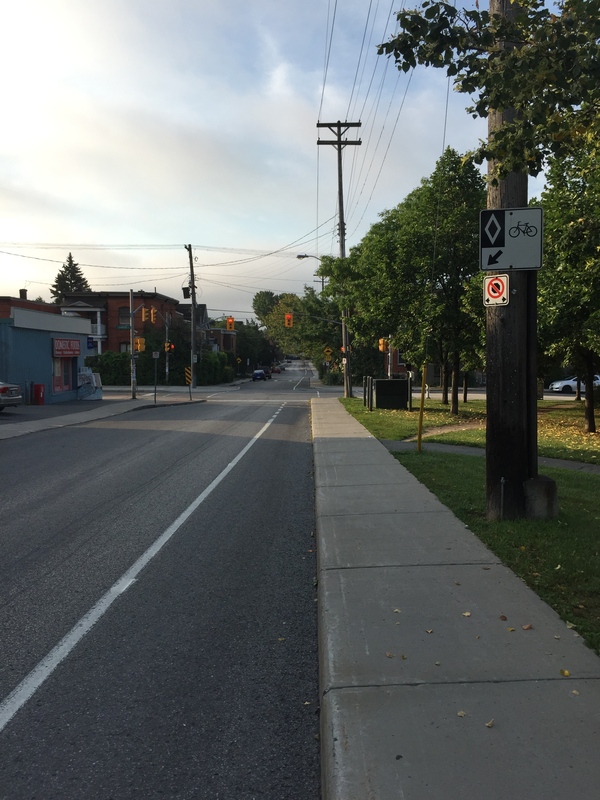 Percy and Laurier is an intersection that’s easily accessible from many points within the business core via the Laurier Bike Lane that slices through downtown. Percy continues on the opposite side of the tunnel under the Queensway sans bike lane. I turned right on Fifth Avenue and crossed Bronson Avenue at the traffic lit intersection. 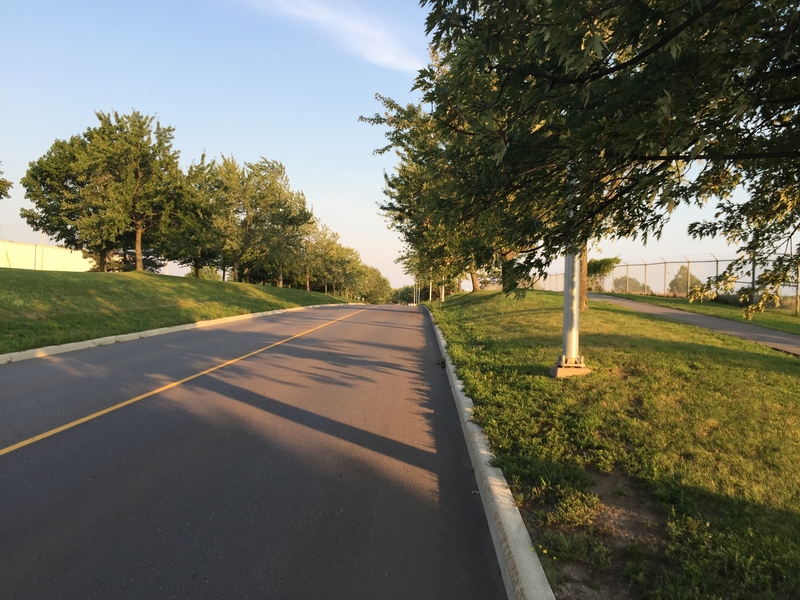 Once across Bronson I continued down Madawask Drive, then onto the pathway that cuts through Commissioners Park. 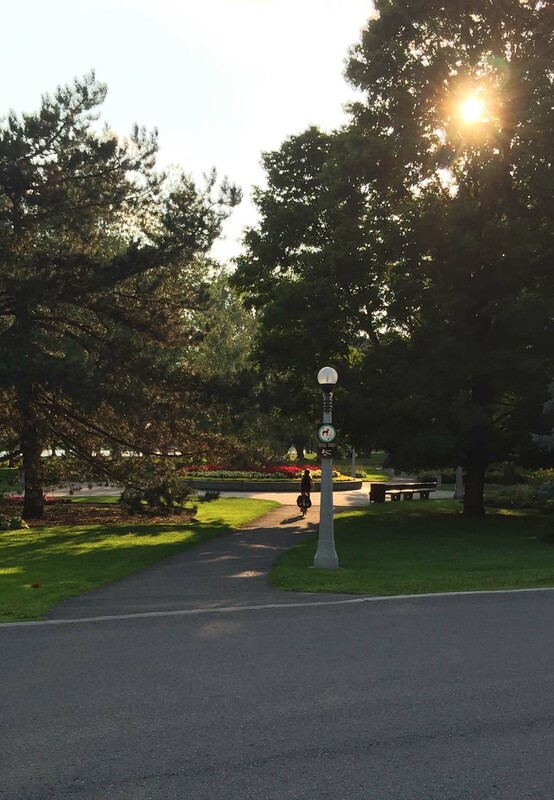 Lovely path through Commissioners Park. Always lots of flowers. 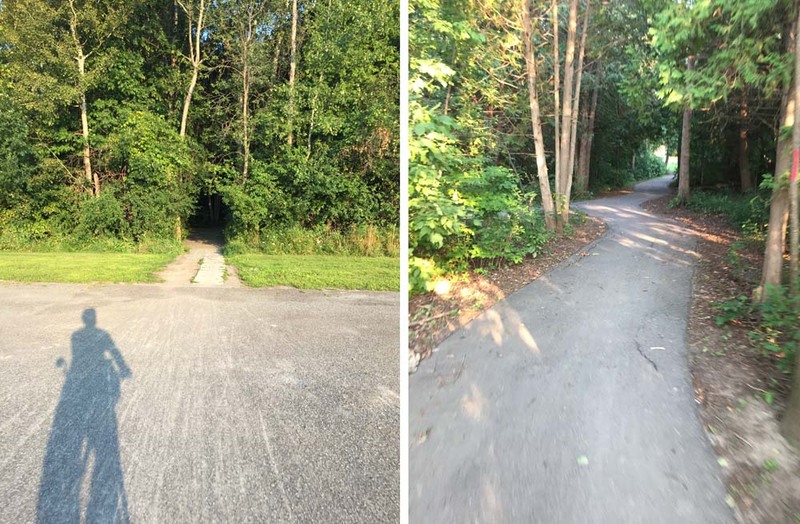 This path took me to the intersection of Preston Street and Prince of Wales Drive. 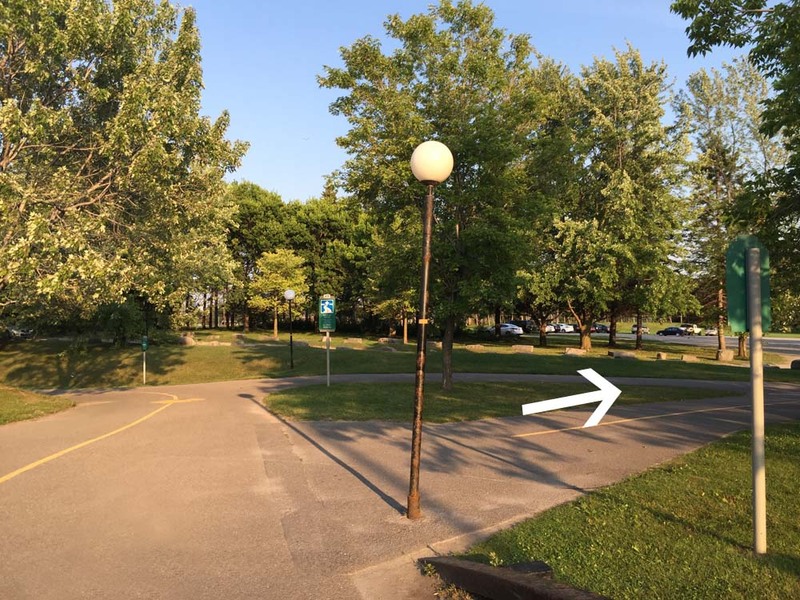 I crossed at the lights and accessed the bike path that runs through the Arboretum along the edge of Dow’s Lake and the Rideau Canal. Ahhh…where are we going again? Oh yes, the airport. 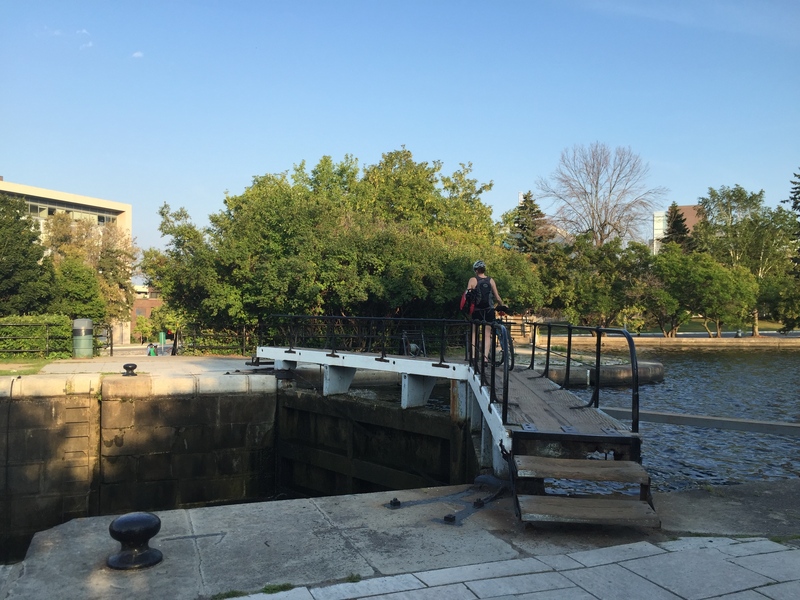 I pushed my bike over the canal locks opposite Carleton University and continued west along the Rideau Canal Pathway as far as Mooney’s Bay. The path continues over the Rideau River along Hogs Back Road. On the other side of Mooney’s Bay Park the path continues along Riverside Drive for a short distance. Riverside Drive is a very busy street with lots of speeding traffic. 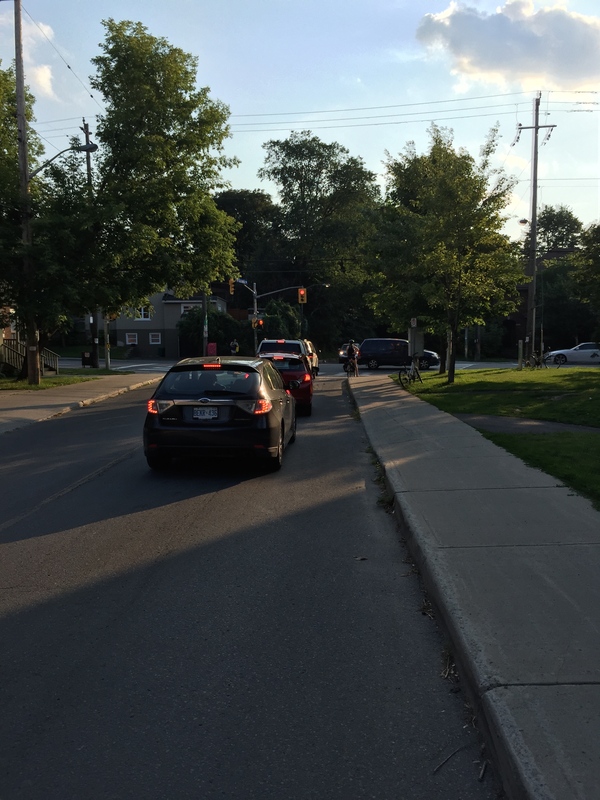 For much of its length there are paved raised shoulders between the sidewalk and the street, however these are mostly lacking along the stretch between Walkley Road and Quesnel Drive. I see lots of cyclists at this intersection whenever I ride through this area. Most stick to the sidewalks because they have little choice, considering the crazy traffic and lack of shoulder space to ride along. 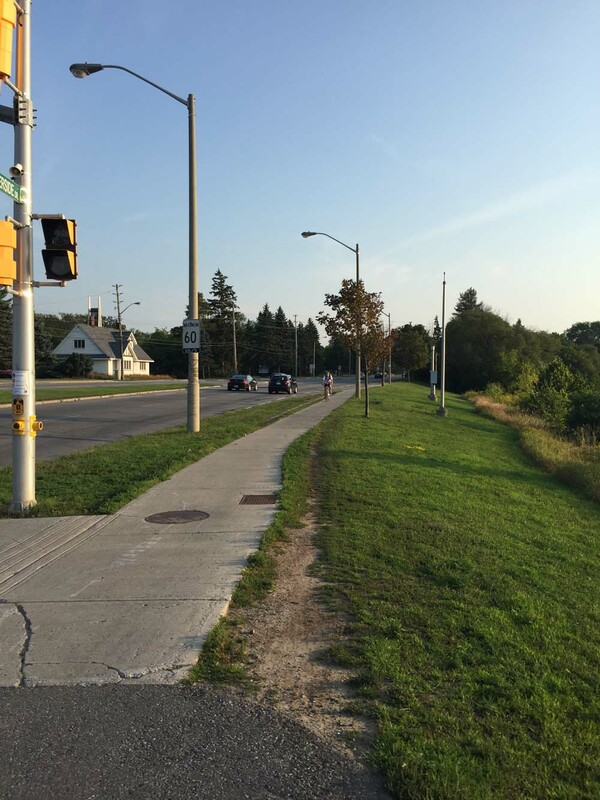 This stretch of Riverside is screaming for bike infrastructure. To avoid this nasty section I rode a short distance along the dirt path beside the sidewalk and crossed Riverside to the parking lot of the Anglican Church. 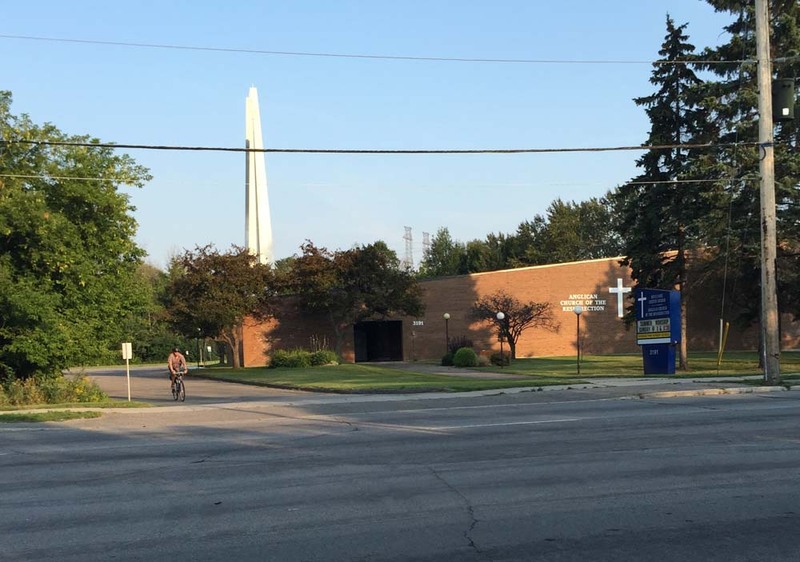 Crossed to the church parking lot, just beyond the cyclist riding on the sidewalk. 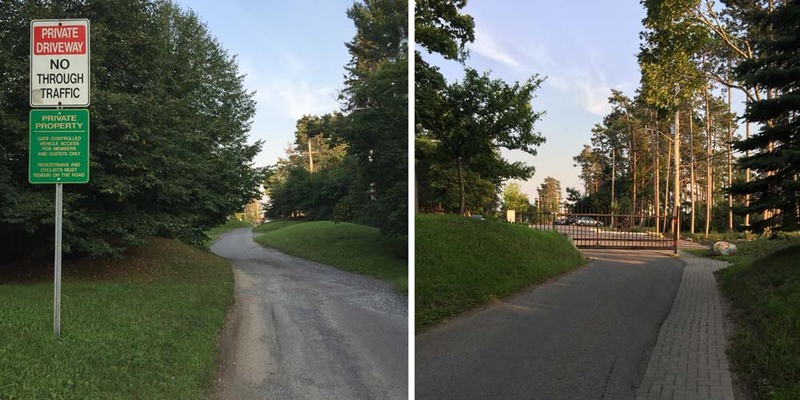 I rode through to the opposite side of the church parking lot to the short path that cuts through to Otterson Drive. I rode south along Otterson, then down the short path that links to Quesnel Drive. 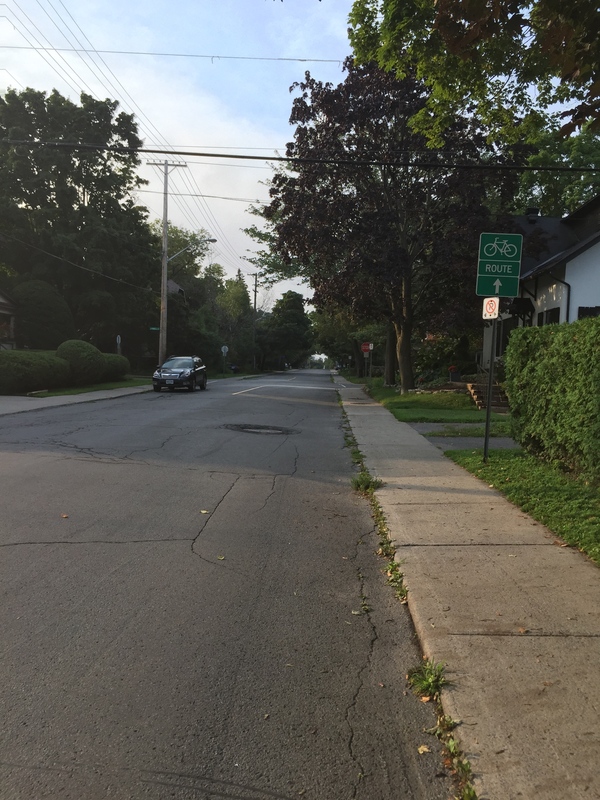 I then got back on Riverside Drive and continued south along the previously mentioned raised paved shoulders. They extend from Quesnel to Uplands Drive, apart from a few spots where Riverside intersects streets and bus stops. Then I turned left on Uplands Drive for a short distance before continuing south along Bowesville Road. Mid way down Bowesville there’s a NO THROUGH TRAFFIC sign, and a smaller green one below it that asks pedestrians and cyclists passing through to remain on the road. That’s because it cuts through the Ottawa Hunt & Golf Club. There’s a steel gate a bit beyond the signs, however there’s space to ride by just to the right. Signs midway down Bowesville, and gate a bit further on. Once beyond the golf club property I crossed Hunt Club Road at the lights and continued south along Paul Benoit Driveway. This is a very pleasant road to ride down. Traffic wasn’t too speedy, the posted limit being 50km/h. There is also a paved path that runs along the west side of the road. To get to the terminal I turned right where Paul Benoit Driveway ends at the airport, straight through the employee parking, then left at the end of the parking lot, which became a lane that airport employees use to walk back and forth to their cars. This lane leads right to the arrivals doors in front of the terminal. Turned right @ end of PB Driveway…straight through parking…left @ end of parking…down lane to arrivals. The following concrete pillars located just outside the entrance to the airport at the arrivals doors have bike racks placed up against them. 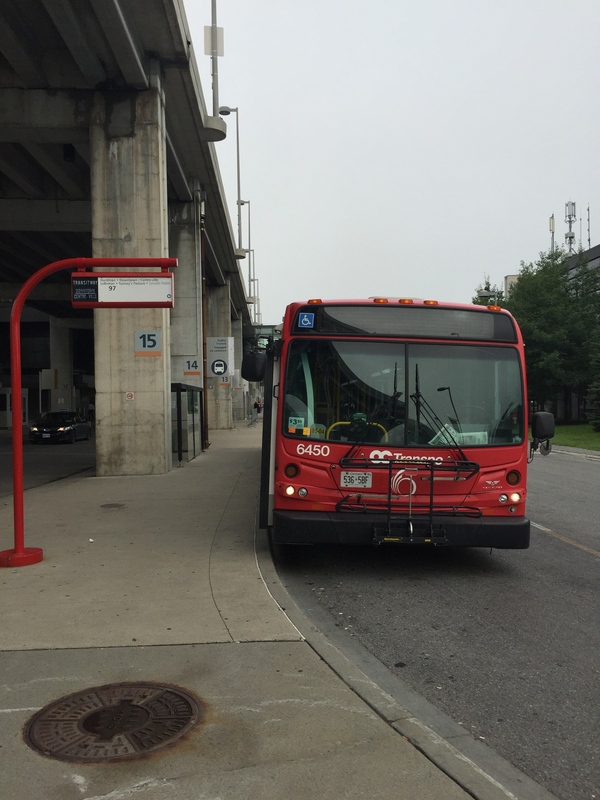 Bonus – if conditions aren’t right for riding back in to town, there’s the OC Transpo 97 with Rack&Roll you can catch beside the last concrete column at the arrivals entrance. I retraced my treads on my ride back, except for the last stretch north of the Queensway where the bike lane is along Bayswater versus Percy, as indicated by the purple line on the above map. Arriving at YOW with a bike is also simple. Arrivals are on the main floor. Go out the main door and cross over the street to the multilevel parking garage. Walk or ride through the garage to the back and out onto the short vehicle ramp onto Airport Parkway Private. Watch for coming cars then go against the flow for about 30 feet and down onto the ramp to Tracker Private (Check it out on Google maps) Proceed North on Tracker Private then turn right onto Silver Star Private. Turn left on Paul Benoit Driveway and continue through the Hunt Club Golf course. Turn left onto Uplands drive then Right on Riverside Drive. 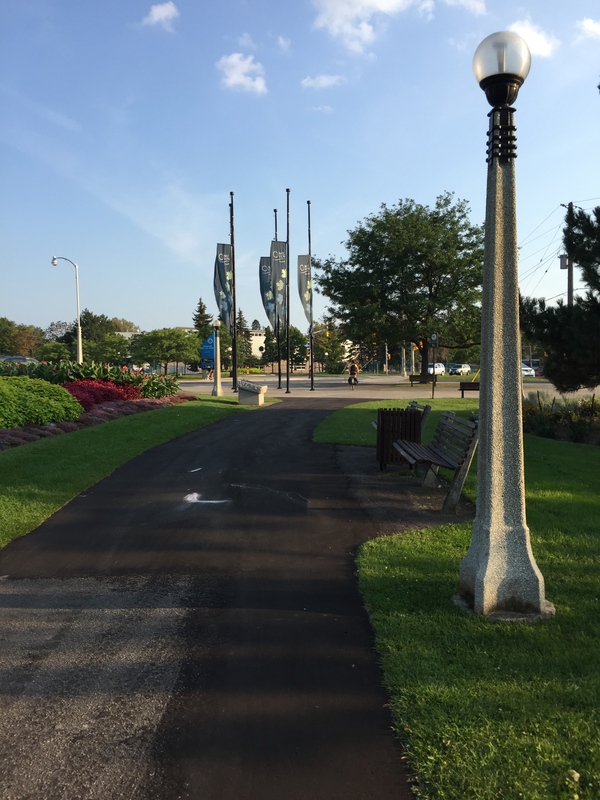 Continue to the bike path through Mooney’s Bay park. 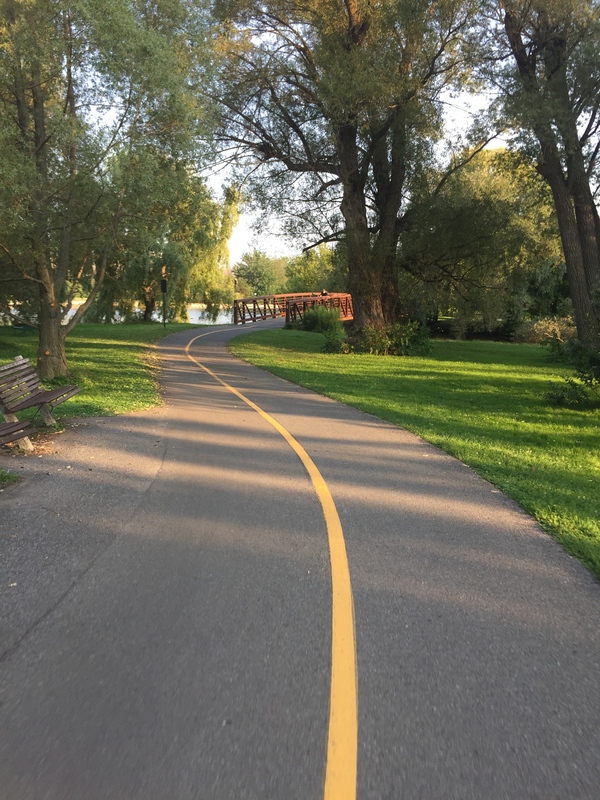 From there continue to Ottawa on the bike paths along the canal or the Rideau River…. Enjoy biking in Ottawa.